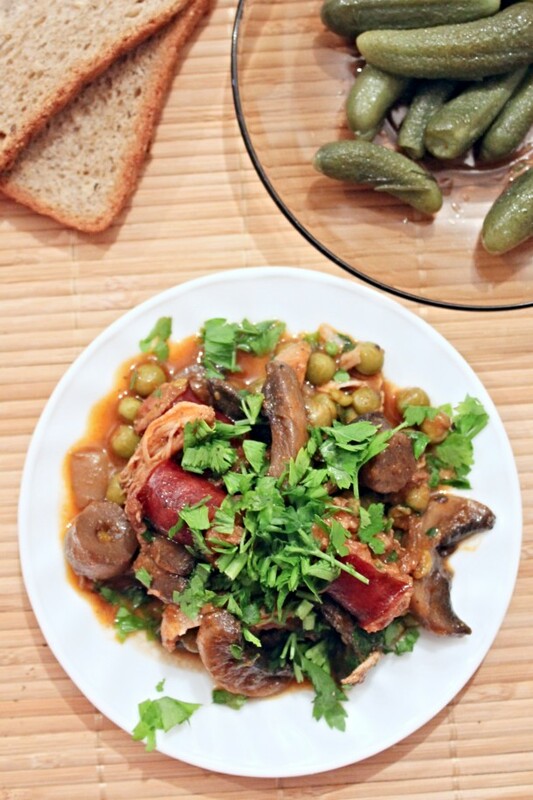 A satisfying stew, perfect for meat and especially sausage lovers, this peas and mushrooms dish comes straight from my mom’s kitchen! 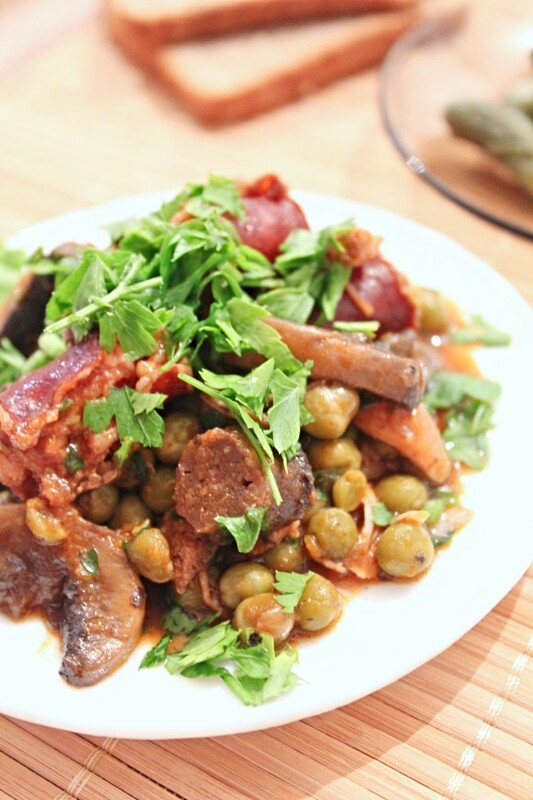 Peas, mushrooms and smoked sausage are sauteed and then braised in an aromatic tomato sauce! 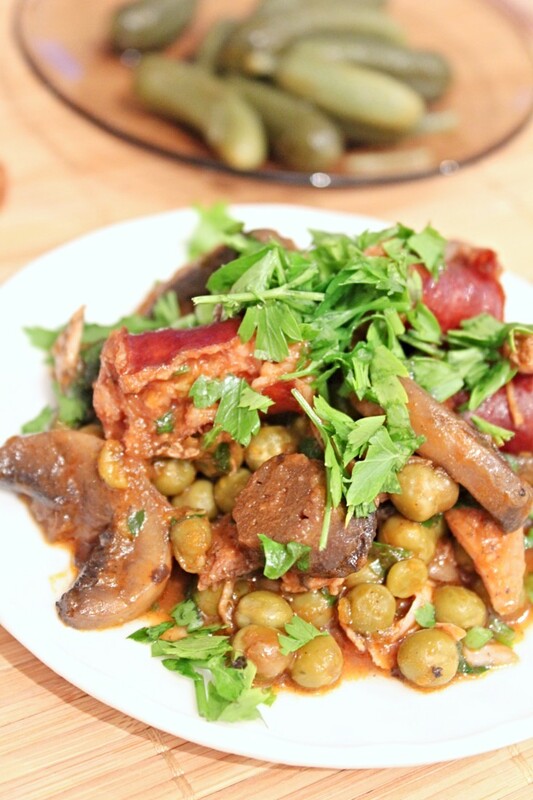 This delicious peas and mushroom recipe is a staple in our family! We resort to this dish pretty often because it’s super quick to make, it’s filling, satisfying and leaves a lot of room for creativity. We adjust some of the ingredients in our peas and mushrooms, to create variety and avoid getting bored with the same recipe over and over again. 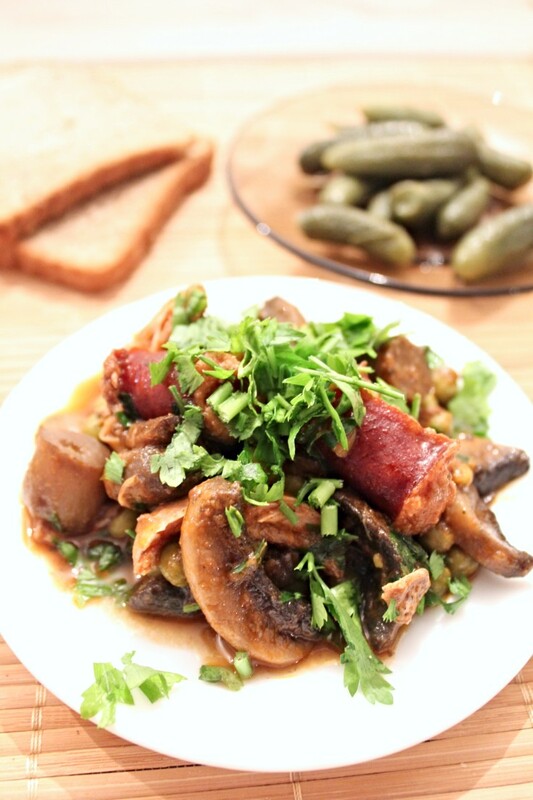 This time around we decided to pair the crunchy peas with lots of mushrooms, both sauteed in olive oil with chopped onion. 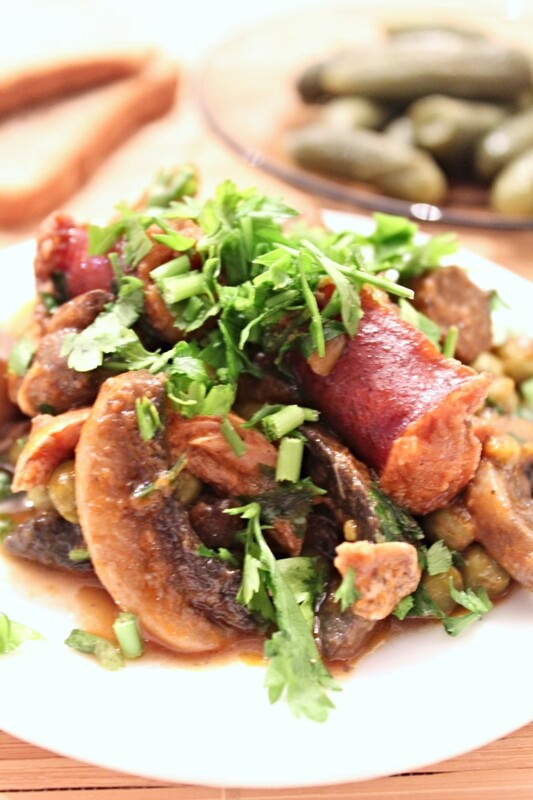 When braising this mushroom and peas stew we added some smoked sausage to enhance flavors and to make this peas and sausage recipe even more satisfying and nutritious. We like serving our peas and mushrooms with a drizzle of extra virgin olive oil, brown toast or pita bread and add some pickled cucumbers on a side or a large mixed greens salad. 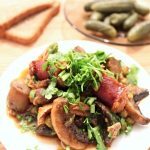 A comforting, warming and flavorful dish, this peas and mushrooms recipe is the perfect dinner idea on chill spring evenings, fall or winter. A few tips regarding this recipe. This is the first time we tried this recipe using sausage and we were pleasantly surprised how good the recipe tasted. However we kind of overcooked the sausages by braising them together with the stew the whole time. This made the stew very smokey so if you’re only looking for a hint of smokey add the sausages towards the end when the peas are almost done. The sausage barely need cooking, about minutes in the pot would suffice, I think. We used canned peas but fresh peas would work great too! They just need a little more time for cooking. If you decide to use canned peas as we did, make sure you wash and drain them very well before cooking. Peas that are not cleaned properly have a hard time cooking so you need to cook longer. Because of the extended cooking time the peas might break and get mushy. Add mushrooms and saute for 3-5 minutes until the mushrooms are medium soft. Continue simmering for 5 minutes. Add fresh parsley when serving.